Who can become a stallholder? Anyone with a sense of fun and the following is very welcome. Preference is given to products and produce grown or made on the Mid North Coast. Products or produce that is made or grown outside the Mid North Coast may be brought to Harbourside Markets if a local equivalent is not currently available. Services are welcome e.g. massage, haircuts, dog washing. We want the markets to be fair & sustainable for everybody so if there are already a lot of people selling similar products you may need to go on a waiting list. How much is a stall and how big will it be? Yes. You need $20,000,000 of product and public liability cover. We are able to sell you insurance on the day for $5.00. This insurance does not cover food, cosmetics and skincare and most services. Can I be casual or do a one off stall? Yes as long as your stall complies with the other guidelines and does not compete with our regular local stallholders. The market starts at 8am and finishes at 2pm. We run every Sunday unless Christmas Day or Anzac Day falls on a Sunday. Call 0407 661 990 when you arrive and we will show you where to go. You can drive in if you are patient & remain on the path. You can only enter & exit via the designated entrances. We have trolleys available for you to use to unload if you choose not to drive in. Unload as quickly and BEFORE YOU SETUP move your car over near the railway. It is a very short walk away. This way the loading areas are kept clear. It is a condition of our licence that we leave the close parking for other visitors to the area and our customers. At 2pm pack up your stall, then drive your car back in and load up. Please pack up BEFORE you drive in. Please call Kim on 0407 661 990 to make your first booking. After the first booking you can book by text. Are tents or tables provided? I'm sorry we do not provide tents or tables. You must supply your own. 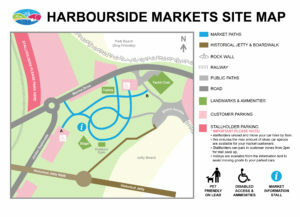 Harbourside Markets is an outdoor venue. Sometimes it is hot, cold, windy or wet! Mostly it is beautiful. We run in all-weather unless it’s dangerous. On the very rare occasions that we don’t run we will post on our Facebook page. Stallholders need to decide for themselves if they want to brave the weather. If you choose not to come you don’t need to pay but you do need to let us know. Just a simple text is great – 0407 661 990. Even if you come and set up but decide to leave before 10:30 due to weather, you don’t need to pay. BUT if you decide to stay you are choosing to pay. If you live out of town and would like to know the weather before you leave, you can call after 5:30am for a weather report. We will answer as best we can. The one question we won’t answer is “Should I come? That is your call. We love to support our local community by offering space for charities and Not For Profits to raise money or to raise awareness. Please call us 0407 661 990 so we can let you know what you can do. These sites are in high demand and availability is restricted. Have a stall set up that is compliant with Coffs Harbour City Council Food Health requirements. Just having the above doesn’t mean you will be able to have a site. We have a long wait list…. Sorry.